If our people map is not failing me, I have today the pleasure to introduce you to our only team mate from India. Radha Pandey lives in New Delhi, and you know her - maybe under her Etsy-name paperspirit - because she already wrote a post on this blog about an amazing book object she found. You can also find her at www.radhapandey.blogspot.com and www.studiochalk.com. Hi, Radha, nice to meet you and to have a chance to learn more about you! 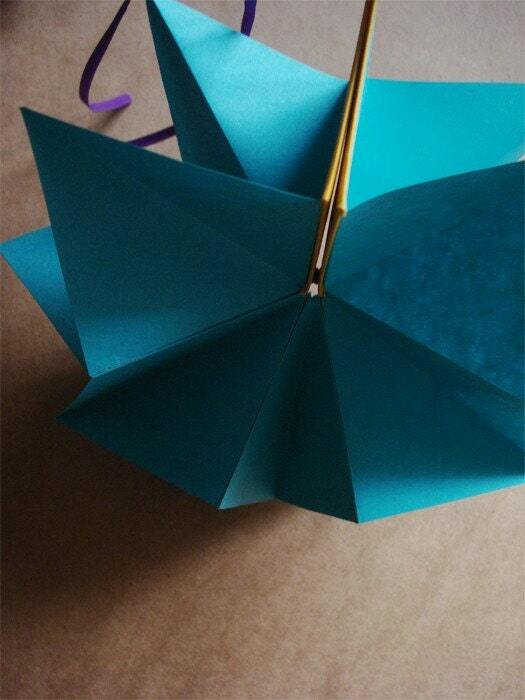 Let's get right into the matter: How did crafting and bookmaking come to your life? My family, including my grandparents, were and are into art and craft in some form or the other. I grew up in an environment that fostered the appreciation for all things hand crafted. Book-binding in particular came into my life not too long ago - and is a long story. Ever since I was a child, I've been fascinated by paper. I remember when my mother came back from a trip to Japan she brought back with her the most exquisite paper and boxes I had ever seen and touched. That same fascination has stayed with me all these years, and I try to incorporate paper, texture, and craft into all my work as much as I can. 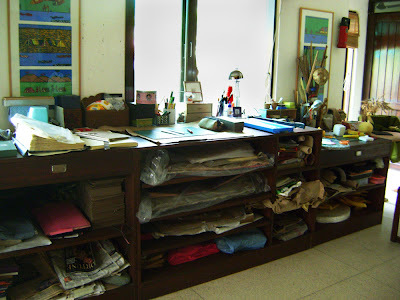 I was offered a fellowship to Haystack mountain school of craft in 2005 when I was still a student. I took the Japanese Paper making course there and met and worked with an amazing group of people. One of them was a book-binder. (Patricia Johnson). I was inspired by her work and her attention to detail. In my final year of college, I apprenticed in the Auroville Paper Press in Auroville, Pondicherry in South India. 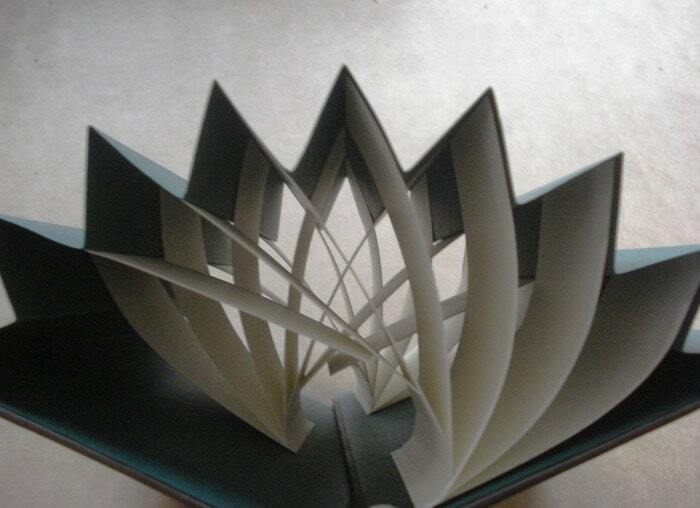 There I worked with paper, paper products of all kinds and even made some of my first books. That sparked my interest and inspired me to contact Patricia. I worked hard and saved for over a year, and then decided to apprentice with her for 6 six weeks in Vermont. That was two years ago. I've been making books and conducting workshops ever since. Auroville, amazing! For how long have you lived there? Any intention of going back, or settling there finally? For my internship I was there for 7 months, in and out, since it is so close to Bangalore. Now that I'm in Delhi I make it a point to visit at least twice a year, sometimes for work, sometimes to visit old friends. I would love to settle there, but its not an easy process, I am told! I am a graphic designer by day. I was trained in Visual Communication Design for 5 years in a design school in Bangalore, S. India. My final thesis project ended up being a stop motion animation film I made using wire frames embedded in handmade banana and cotton papers. Do you like about splitting your worklife between Studio Chalk and Etsy, or what do you like about it? Well, its a bit of a juggle - but I make sure I find time to do what I really love doing - working with my hands. The best part of it is, saving enough money to make more books, and travel to places I haven't been before to learn something new. I recently went to the Philippines for a course on Pineapple fiber and natural dyes. Ah, you travel! Do you have a favorite place somewhere in the world? I love to travel! It's my main incentive for work! Every place has its own unique smell, flavour, experience. I can't say which is my favourite. But if I had to choose, I would say, Auroville, Paris, Zanskar valley, Mussoorie to name a few. What is there a place you still would like to explore? I would love to go to Turkey, Greece, Moscow and Berlin. And if I can combine Bookbinding or papermaking in any way in these places - I don't think I would ever leave! Tell us a little more about your shop: What do you make and sell? The market in India is still at a nascent stage, and its very hard to sell handmade books/products here. In fact, I have to create a market. And that's basically what led me to trying out Etsy. My shop is fairly new. I started only 4 months ago. I haven't had any sales, and I am partly to blame as I don't find the time to maintain and update my shop as often as I would like. I have made a few custom-made books though, which I really enjoyed. I love making Coptic bound journals and accordions with decorative covers and handmade papers. I just love finding the perfect ribbon, paper, thread and wood blocks for printing. A book can take me very long to make, because I like to wait until I find just the perfect ingredients. The world around me, beautiful paper, cloth, an interesting piece of ribbon or button that I find on the road. Usually it's the materials that inspire the final book. 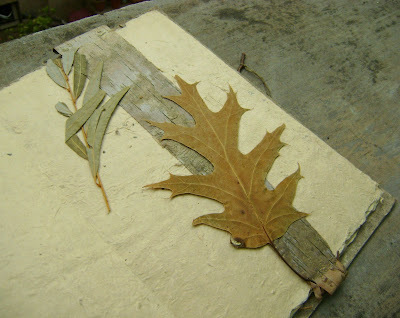 When I was in Vermont, the beautiful trees inspired me to make a journal to document them. For it, I made paper out of Gampi fiber and put it together in an accordion form. I made the covers from Banana paper from the Auroville press and found the perfect twigs for the closure. 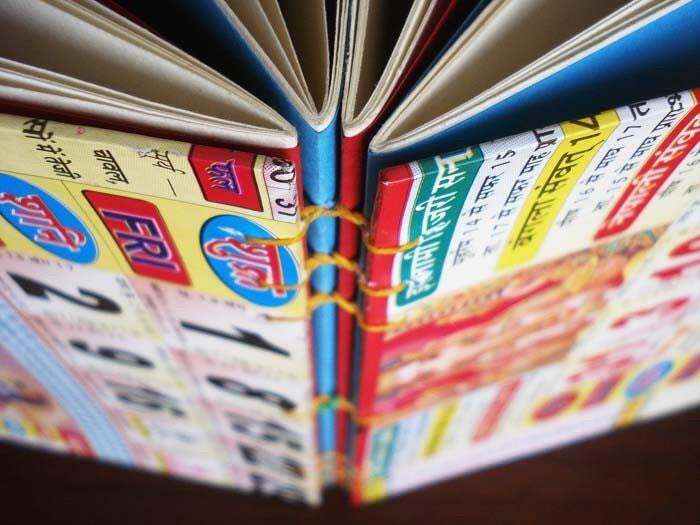 I would say the most challenging part of bookbinding in India is having to explain to everyone what that actually means. I mean we have hand-bound books here - but it isn't considered a craft, let alone art. No one understands how much time and effort something like this takes. As a result there is no market, no interest, and no understanding or knowledge. It's extremely frustrating and also lonely. There are no special tools or thread or good quality board that is locally available. 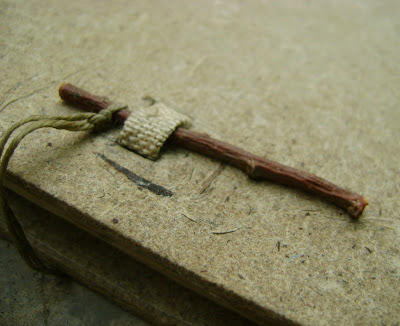 I have to get my tools custom made, ask someone coming from abroad to get me good waxed linen... Its hard. Well, this summer I'm going to be traveling to the US, back to Haystack to do a course in Paper by Beatrice Coron thanks to the work-study scholarship I applied for. I am also planning to intern at Cave Paper in Minneapolis. I would definitely like to expand my binding skills. While I am there, I hope to find people interested in taking on interns in their binderies. As for the shop, I plan to add boxes, and precious stacks of deckle edge handmade paper from all the fiber I've been sourcing. Thank you, Radha for taking your time talking with me. If you want to see more of her books, click here to be brought directly to her Etsy-Shop. Wow! This interview was very inspiring. 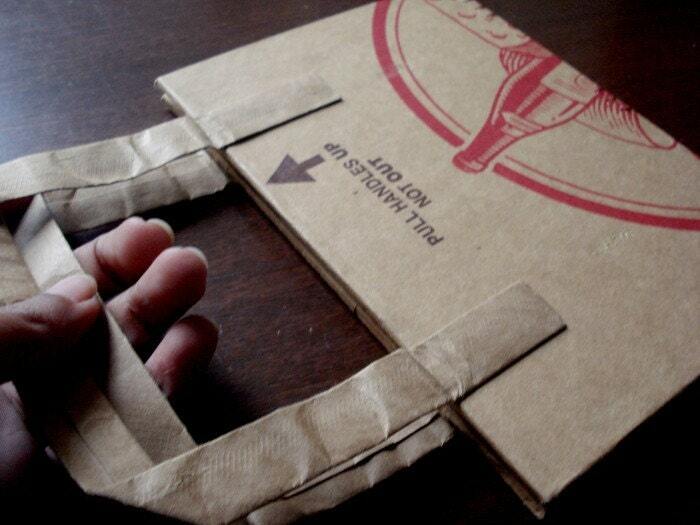 Makes me want to start making things with my hands almost immediately! What an amazing interview! Your animation was lovely, as are your books. And thanks for speaking about the difficulty in getting supplies. I hadn't realized that could be another obstacle in making things you really love. Your film was amazing! It must have taken quite a long time to design and put it all together. Beautiful work Radha!